Astigmatism is the most common refractive problem responsible for blurry vision. You may also hear astigmatism called a refractive error. Most of the eyeball's focusing power occurs along the front surface of the eye, involving the tear film and cornea (the clear 'window' along the front of the eyeball). The ideal cornea is shaped like a "baseball" meaning it has a symmetrical curved surface. 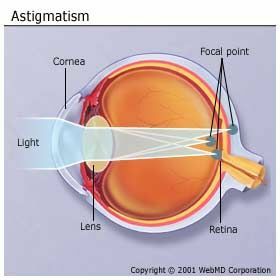 Astigmatism is caused by a cornea that is shaped like a "football" which is not symmetrical. The cornea is the transparent window over the colored part of the eye. It bends (refracts) light rays and helps focus the light onto the retina in the back of the eye so people can see. When the cornea is oblong shaped, it causes light rays to focus on two different points on the retina, instead of just one. As a result, people with significant astigmatism may have distorted or blurry vision. The center 3 mm portion of the cornea is the critical region for clear vision. Folks with small amounts of astigmatism usually have no symptoms because ordinary blinking helps the cornea maintain its symmetrical curve. Astigmatism is measured in diopters. More than 1 diopter typically requires correction with glasses. Soft contact lenses can also correct small amounts of astigmatism. Toric and rigid gas-permeable contact lenses can correct moderate amounts of astigmatism. More about contact lenses later. Astigmatism can run in families and often occurs in combination with other refractive problems such as nearsightedness or farsightedness.